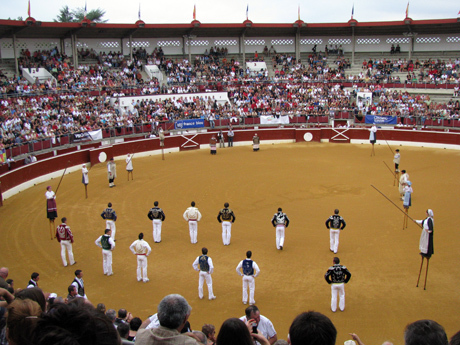 The Course Landaise is a bloodless form of bullfighting that is very popular in Southern France, particularly in the Gascony region. The Championnat de France of the Course Landaise was held this year at the Arena of Mont-de-Marsan on October 3. I went to watch. When I say bloodless, I mean — it’s bloodless for the cows (the Course Landaise uses cows, not bulls, although they’re still horned and hefty). It’s a little bit like bowling: the cows are the bowling balls, and the humans are the pins. And then it begins! First come the écarteurs, literally “dodgers”. 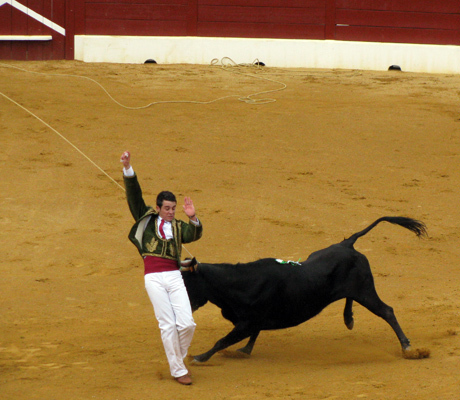 The cow is maneuvered by ropes until it’s ready to charge; when it does so, the écarteur’s job is to wait until the last possible second, then dodge aside gracefully. This works out well sometimes and not so well at others. Out of the six who started, three were eliminated due to injury. And Hop! Next come the sauteurs. Their job is a little more artistic, and slightly less dangerous. 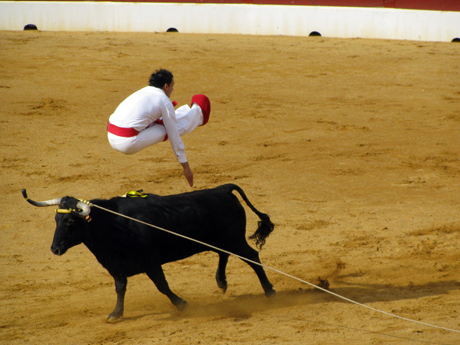 They’re mostly gymnasts, and rather than dodging the charging cow, they jump (or flip, or spin) over it. Or, sometimes, they’ll put their feet in a beret and jump across “one-legged”. And that’s the Course Landaise.